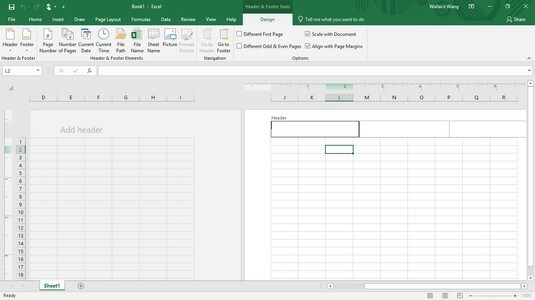 After you create a spreadsheet in Excel 2019, you can print it for others to see. When printing spreadsheets, you need to take special care how your Excel spreadsheet appears on a page because a large spreadsheet will likely get printed on two or more sheets of paper. This can cause problems if an entire Excel spreadsheet prints on a one page but a single row of numbers appears on a second page, which can make reading and understanding your spreadsheet data confusing. When printing spreadsheets, take time to align your data so that it prints correctly on every page. 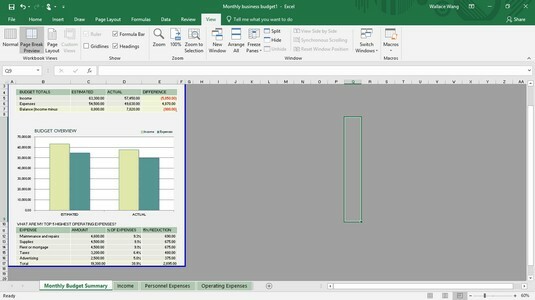 Excel can display your spreadsheets in three ways: Normal view, Page Break Preview, and Page Layout view. Normal view is the default appearance, which simply fills your screen with rows and columns so you can see as much of your spreadsheet as possible. Page Break Preview displays the boundaries of each page so you’ll know what each page will display if you print it. Page Layout view displays your spreadsheet exactly as it will appear if you print it. You can not only see where your page breaks occur but also add headers to the top of your spreadsheet. Click the Normal, Page Break Preview, or Page Layout icon in the Workbook Views group. The Page Layout view clearly shows where page breaks occur at the bottom and sides of your spreadsheet. You can also click the Normal or Page Layout icons in the bottom-right corner of the Excel window. You can slide the Magnification slider in the bottom-right corner to zoom in or out so you can see more spreadsheet detail or less, respectively. A menu appears below the Text icon. Click the Header & Footer icon. Excel displays the Design tab and creates a text box for your header and footer. The Design tab provides tools for creating a header or footer. Type your header text in the header text box. Click the Go To Footer icon in the Navigation group. Excel displays the footer text box. Type your footer text in the footer text box. If you switch to Page Layout view, you can click directly in the header or footer box at the top or bottom of the page and type your text. Gridlines appear on the screen to help you align data in rows and columns. However, when you print your worksheet, you can choose to omit gridlines or print them to make your data easier to understand. To print gridlines, select the Print check box under the Gridlines category. To print row and column headings, select the Print check box under the Heading category. Select the cells that you want to print. Click the Print Area icon in the Page Setup group. Excel displays a line around your print area. A print preview image of your chosen print area appears. The Print Area menu lets you define or clear the printable cells. After you define a print area, you can see which cells are part of your print area by clicking the downward-pointing arrow of the Name box and choosing Print_Area. Select the cells adjacent to the print area. Excel displays a line around your newly defined print area. One problem with large spreadsheets is that when you print them out, parts may get cut off when printed on separate pages. To correct this problem, you can tell Excel exactly where page breaks should occur. Move the cursor to the cell that defines where the vertical and horizontal page breaks should appear. Click the Breaks icon in the Page Setup group. Excel inserts a horizontal page directly above the cell you selected in Step 1, as well as a vertical page break to the left of that cell. The Breaks menu lets you insert a page break. To remove a horizontal page break, click in any cell that appears directly below that horizontal page break. To remove a vertical page break, click in any cell that appears directly to the right of that horizontal page break. To remove both a vertical and horizontal page break, click in the cell that appears to the right of the vertical page break and directly below the horizontal page break. Excel removes your chosen page break. If you have a large spreadsheet that fills two or more pages, Excel might print your spreadsheet data on separate pages. Although the first page might print your labels to identify what each row and column may represent, any additional pages that Excel prints won’t bear those same identifying labels. As a result, you may wind up printing rows and columns of numbers without any labels that identify what those numbers mean. Click the Print Titles icon in the Page Setup group. The Page Setup dialog box appears. To the right of the Rows to Repeat at Top text box, click the Collapse/Expand arrow. The Page Setup dialog box shrinks. Click in the row that contains the labels you want to print at the top of every page. Click the Collapse/Expand arrow again. The Page Setup dialog box reappears. To the right of the Columns to Repeat at Left text box, click the Collapse/Expand arrow. Click in the column that contains the labels you want to print on the left of every page. 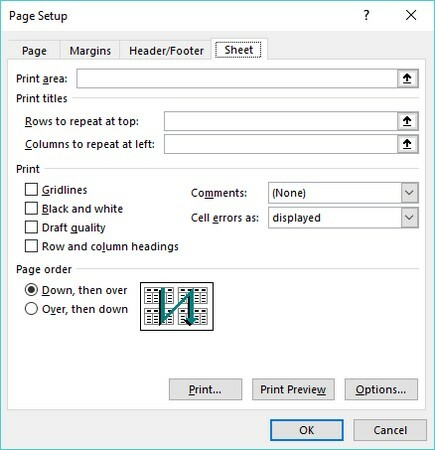 The Page Setup dialog box lets you define the row and column headings to print on every page. Click the Margins icon in the Page Setup group. Choose a page margin style you want to use. The Margins icon lists predefined margins you can choose. If you choose Custom Margins in Step 3, you can define your own margins for a printed page. Paper orientation can be either landscape mode (the paper width is greater than its height) or portrait mode (the paper width is less than its height). Paper size defines the physical dimensions of the page. Click the Orientation icon in the Page Setup group. Click the Size icon in the Page Setup group. The Size menu lists paper sizes you can use. The Print Preview appears in the right pane. (Optional) Select any options, such as changing the number of copies to print or choosing a different page size or orientation. Click the Print icon near the top of the middle pane.